In her continuing effort to build bridges with the Arab world, we have received the following article from Pamela Geller which we are publishing below. We decided to keep Ms. Geller's unique style of grammar and punctuation in the interest of authenticity, even though it doesn't resemble the English language as everyone else understands it. To Muslimanics everywhere, I say I have a message of love. I love for you to stay where you are. 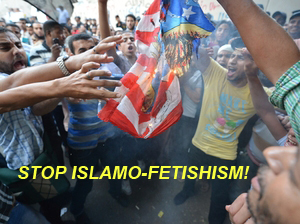 Stop coming to America and, trying to change our freedom-loving ways. You notice that I am big on love. You must have seen the famous photo of me, I am wearing a necklace that says ‘LOVE’. Someone once told me that’s ironic. But I didn’t understand his fancy liberal university talk. But I hate that photo. It makes me look like Jezebel after a hard night out in the bars of *Jerusalem*, but with a better set of teeth thanks to America’s high standards of dental hygiene which reflects our civilization. My complexion has the red-glow of a witch burning; at the stake. Which reminds of me of those commie-liberals that destroyed our freedom to burn witches. Another liberal joked with me about that once, but I didn’t get it. Some people say I’m impervious to humor. This is not true. For one thing, I don’t know what impervious means. It must be one of those British words that keep popping up in English. But my friends in the EDL are different. They use simple words like ‘ughhh’, ‘grhhh’ and ‘Islamo-fashitik’. Their teeth are terrible though. They explained to me it’s because the communist Labor party in England has this thing called NHS which takes away people’s right not to have free health care. And it ruins their teeth. In my blog, AtlasWhines, I always try to explain my misunderstood position on Arabs and Muslimics. I have nothing against Islam. But I have a problem with people believing in it and practicing it. Especially if they want to do it in America, the land of freedom. They want to bring dhimmi to America to subjugate us. It’s very useful to find words like that from history and use them to prove a point. I mentioned this in an argument with a pinko-liberal once, and he agreed with me and said, ‘yes, like, racial segregation or manifest destiny.’ But I didn’t understand what he meant. In fact, last night I was watching this documentary on TV called ‘Homeland’, it had scary stuff. There are Jihadi agents infiltrating the highest levels of governments to spread doubt, uncertainty and violent internal monologues reflected by sharp facial grimaces and nobody’s doing anything about it. This officer had returned from captivity in IRAk and he was brain-washed by the savajes. They did this cruelly to him by making him play soccer with a child. The savage Islamo-fetishists. Some people have objected to me calling Jihadis ‘savages’. But a professor reassured it’s ok once because it’s easier to dehumanize all Muslims this way. I know that not all Muslims are Jihadis, that’s why I’m talking to you here, but we’re talking about 95% of Muslims who are Jihadis, know a Jihadi, or want to be a Jihadi. And they will destroy American by building big mosques all over the country. We don’t allow anyone to go constructing large buildings that all look the same all around the country. Imagine what America would look like if that happened. In my blog, Atlas Foams At The Mouth, I always rail against Political Correctness. I call it Political Wrongness. I came up with that in a moment of inspiration once while watching John Bolton’s mesmerizing mustache, as his lips moved and formed angry circles underneath. He was talking about nuking the UN building but then we realized that some innocent New Yorkers might die in the attack. But I live his mustache, it’s so different from those Arab mustaches that are taking over America. He told me it’s based on the original sketch for the Berlin Wall, he wants to build a similar on all along the border with Mexico. My friend Robert Spencer also has a mustache and a nice beard. Once we were joking around and he put a towel on his head and he looked just like a Jihadi savage. It was a profound moment, but we didn’t understand what it meant. Robert runs Jihad Watch which I thought was a website to sell Jihadi Watches and you know what these savages can do with a watch. Tick, tock, tick, tock. But it turned out it’s a freedom-loving website that is very creative in reporting Jihadi activities. Anyway, I’m forgetting my main message here. Some of you might have heard about the controversy around the ads that I placed in the NYC subways. They said: “In any war between the civilized man and the savage, support the civilized man. Support Israel, defeat Jihad.” Some people misunderstood that as being anti-Muslim and anti-Arab. In fact,it’s against all the savages, that want to come to America and destroy our freedom. You’re all equal in my eyes. The vicious reaction to the ads really hurt my feelings. Especially from some Fascist savage Islamic supremacists that defaced the ads. A historian pointed out to me that savages by definition don’t have the technological capability to invade other countries and devise supremacist ideologies, but I dismissed his fancy liberal talk and continued eating my freedom fries. My message to you is leave us alone and stop sending your flying death machines to our country. In case you got here and you still haven't realized it, this is a parody. That's a PARODY. hmmm...this is quite a matter of concern!